Like the headlines said, “Ben Baller Did The Chain. 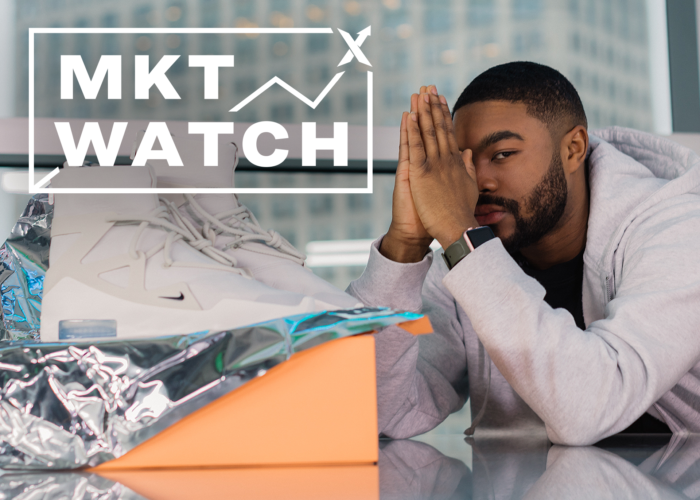 StockX Changed The Game.” But now it’s time for you to really understand the magnitude of our first ever true IPO. Editor’s Note — AKA your TLDR: This is our comprehensive breakdown of the Ben Baller Did The Chain IPO. It’s a long and in-depth read, so if you’re looking for quick highlights, know this: Over the 3 days of our IPO, we received over 10,000 Bids on the 800 slides listed, and because of the unique pricing method, using our take on a blind dutch auction, the black slides sold at an average Clearing Price of $181 and the red at $260. 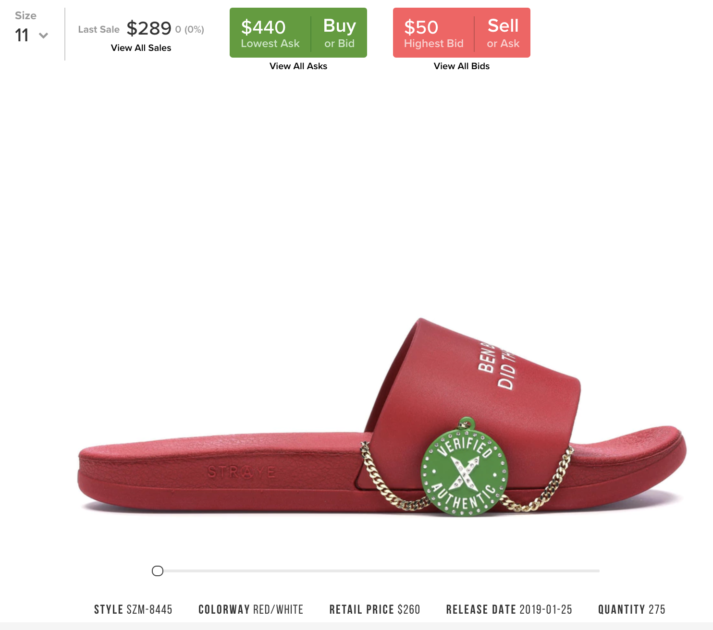 Now that the IPO is over, the “Ben Baller Did The Chain” slides can be bought and sold on StockX like any other item, and prices look to be increasing. So for all the details, settle in, pour a fresh cup of coffee, and read up. Last week, StockX made e-commerce history with our Ben Baller Did The Chain IPO. Ben is a world-famous celebrity jeweler and cultural icon that has been name dropped in countless songs. But ASAP Ferg’s 2017 hit “Plain Jane” truly cemented Ben’s hip-hop legacy with the hook: “Ferg is the name. 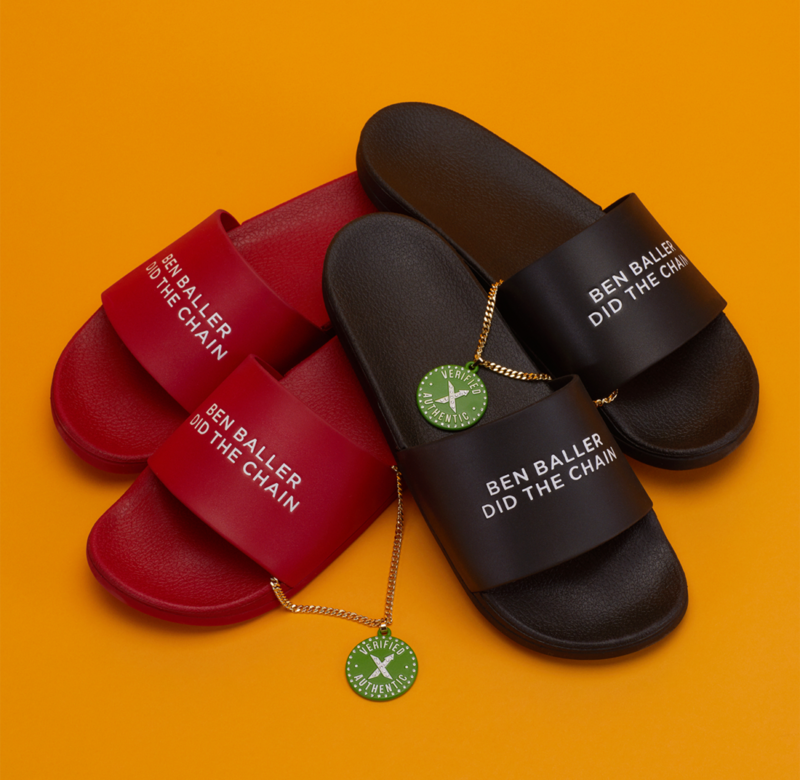 Ben Baller did the chain.” The line took off as people used it on Twitter, Snapchat, and Instagram comments, even signing their bill at restaurants with it, until it eventually ended up on a pair of slides. The first run of the slides were the black pair, made exclusively for Ben’s birthday. 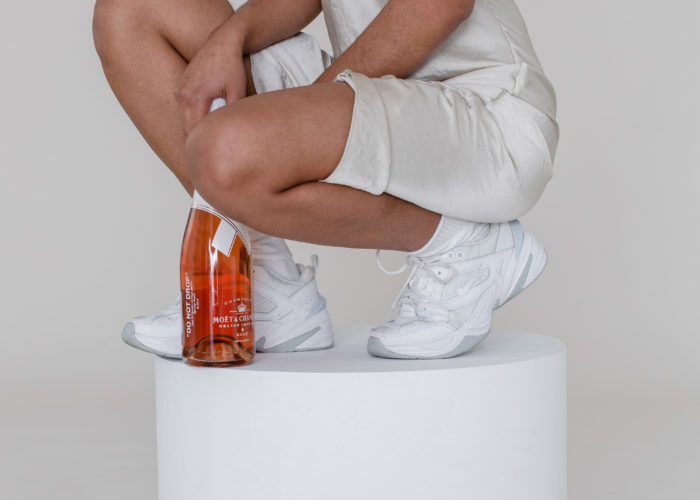 Straye, a new footwear brand from the founder of Supra, decided to make 100 pairs for the special event. so Ben only handed them out to friends and family that came through his house. The lucky few that scored a pair became obsessed. The reaction he got from the people that wore them was so strong he decided to do a bigger release, including a new red colorway, and that’s where we at StockX come in. This was the first time a consumer good, let alone a slide, was ever released to the public via a blind dutch auction, a method traditionally used to price out stocks and securities. By releasing the slides in such a unique manner, we allowed our customers, and the market at large, to set the price they were willing to pay. But before we dive into the results, it’s worth reiterating how this unique take on a blind dutch auction exactly worked. StockX customers went to our IPO page and placed Bids on the slide in the size and color of their choice for whatever they were willing to pay. These Bids were 100% anonymous; no one could see what other customers were Bidding. The only thing the could see was the total amount of Bids on the slides product page. Once the auction ended, we then took the top Bids that matched the quantity we had in stock to determine who won a pair of slides. For example, if there were 20 pairs of Black Size 9, then the top 20 Bids on Black 9 won the slides. However, all winners were charged the same amount – what is called the ‘Clearing Price’. The Clearing Price was the lowest winning Bid in whatever that slides quantity was. So in the example above, the 20th Bid was the Clearing Price. This means that even if you were the highest Bid at $1000, if the Clearing Price was $300, then you won the slides for only $300. After 3 days, our Ben Baller Did The Chain IPO garnered 10439 Bids on the 800 slides we listed. The Bids ranged from $50 to over $1 million dollars. Seeing as how transparency is one of the core tenets of StockX, we even decided to create a chart that shows every single winning Bid placed on this IPO. 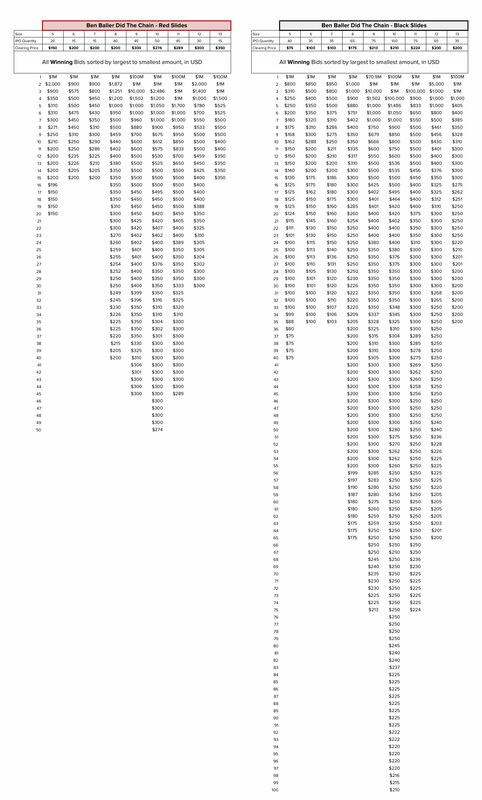 It’s a massive chart, so consider this your warning. (And if you want to view every Bid for every size and color, check out this spreadsheet). You’ll notice that for certain items, there were some extremely high Bids – for example, a $1M Bid for the black size 5 slide. We don’t believe this Bidder wanted to pay $1M. Instead, they were employing a (somewhat risky) strategy to ensure they’d win the slides, no matter what. These Bidders likely assumed that most people would Bid much lower amounts. By Bidding $1M, they’d be guaranteed to win the slides, and would only end up paying the much lower Clearing Price. What makes this strategy risky is that it depends on most other Bidders not pursuing it. If more than 42 people had Bid $1M for the black size 5, they would have all paid a 7-figure Clearing Price. But as it turns out, that’s not what happened. The strategy paid off. But where this IPO gets truly interesting is in looking at the Clearing Prices for each slide. Like any market pricing model, the Clearing Price for this auction was driven by two basic forces: supply and demand. First, let’s talk about supply. When working with Ben Baller and Straye, the manufacturer for the slides, we purposely kept our supply of the red slides smaller to create scarcity; we also varied our supply for each size to a more traditional retail footwear allotment — meaning we had more supply in popular sizes like 9, 10, 11, and 12, and less supply of sizes like 5 or 13. 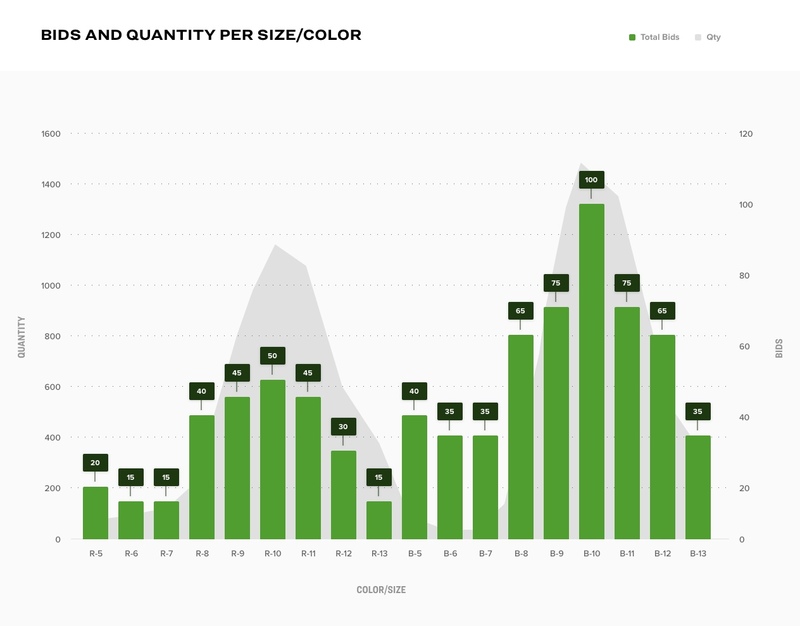 The following chart breaks down our exact supply of slides by size and color. Now, despite the smaller supply of red slides, there was no reason to think that demand would be significantly lower. 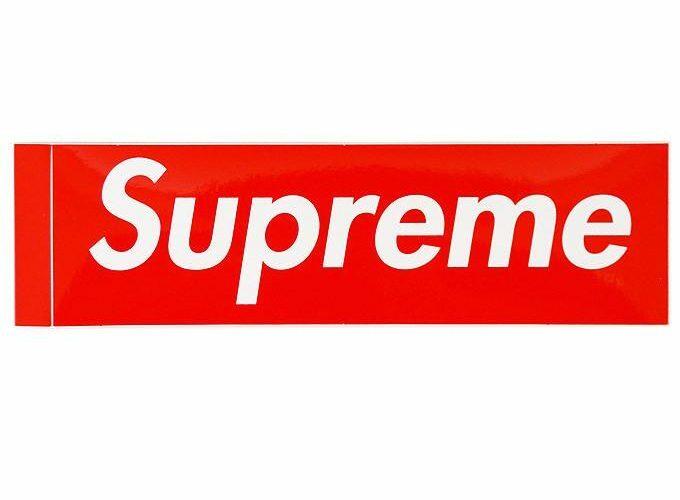 Indeed, given the similarities between the slides, we expected the demand – that is, the quantity of Bids – to be roughly equivalent for each colorway. And that’s exactly what we saw. In the following chart, demand (quantity of Bids) is represented by the shaded area and is measured on the right y-axis; and supply (quantity available) is represented by the bars and measured on the left y-axis. 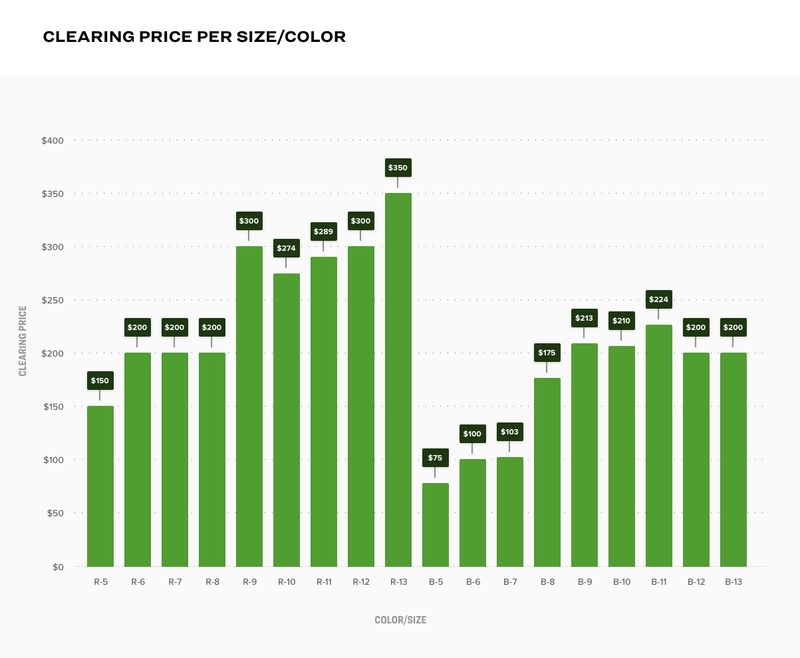 As you can see, while demand varies widely according to size (with popular sizes like 9 and 10 receiving far more Bids), the overall demand was roughly similar for each colorway. For example, there were just under 1200 bids for Red Size 10, and just over 1400 for the Black Size 10. What do these ratios represent? In a word: hype. After all, hype arises from the discrepancy between demand and supply. The more that demand outstrips supply – the higher the ratio between them – the bigger the hype. And this brings us to the Clearing Price. You can see that the Clearing Price — again, the last High Bid in the quantity available — varied significantly, ranging from as little as $75 to as much as $350. And the variation in price closely followed the variation in hype. Thus, the Clearing Price was higher across the board for the red slides compared to the black. And the slide with the highest ratio of demand to supply (the red size 13) was also the slide with the highest clearing price ($350). 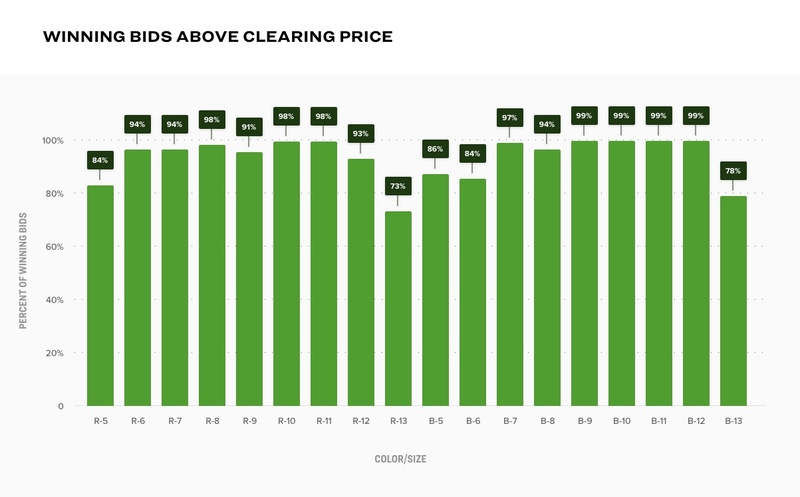 The chart above shows the percentage of winning Bids that came in above the Clearing Price. 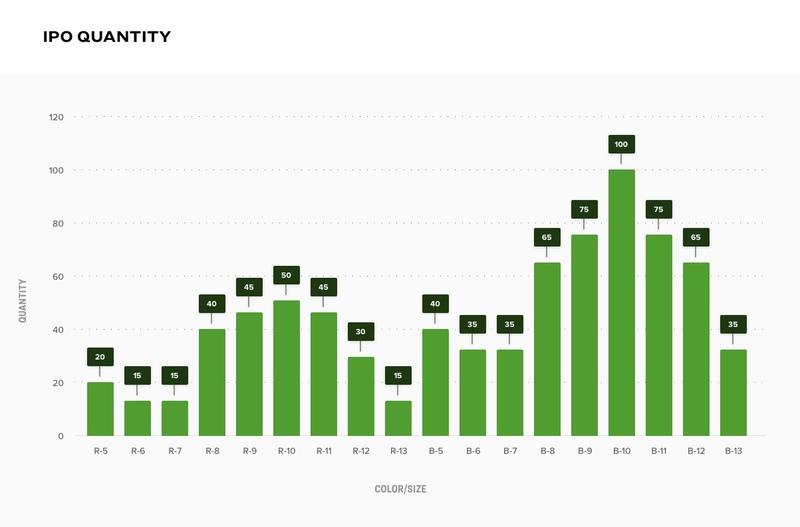 Over 90% of the winning Bids on the majority of slides came in higher than what they paid. The red size 13 is the only outlier because we just so happened to have a number of Bidders submit the exact same Clearing Price Bid ($350). 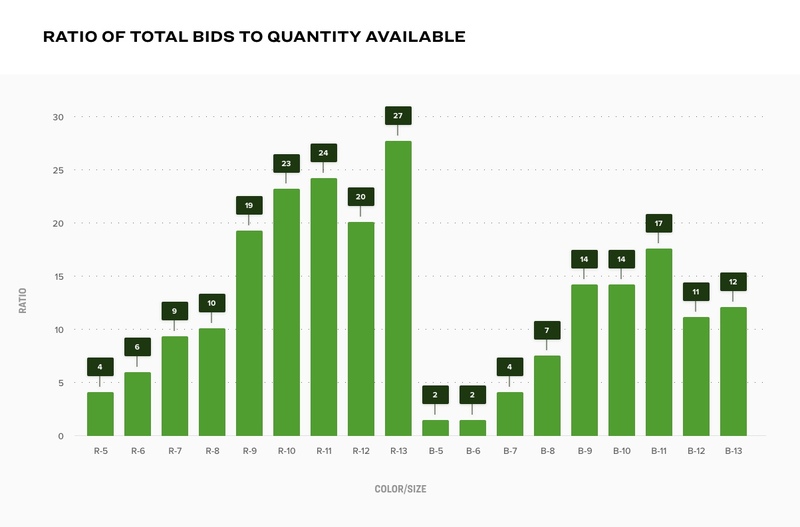 And even in that case, 73% of the winning Bids were higher than the Clearing Price. In the days and weeks ahead, things will get even more interesting, as the red and black slides can now be resold on our marketplace. Already we’re seeing Asks come in at more than double the Clearing Price in both colorways of the slides. If history is any indication, the price should stay well above the Clearing Price. Remember, there were many Bidders who thought they were worth more than what they ended up paying. But the really exciting takeaway is what this IPO means for the future of shoe releases and e-commerce in general. Again, these “Ben Baller Did The Chain” slides were not released anywhere else. They were made exclusively available on StockX with no set retail price. And this pricing model presents clear, undisputable advantages when compared to the traditional retail model. Imagine what would have happened if Ben had released these slides at a traditional retail outlet. Things would’ve turned out much differently. Let’s say he took the same quantity of red slides to a traditional outlet, and priced them at around $70; based on what we known from Ben and the retail slide market, $70 would have been a reasonable price. So imagine there are 275 products for sale at a retail price of $70, but the resale market values them at as much as $400. What happens then? Mass chaos. If they were released in stores, you might have seen campouts and crowd control issues. If released online, sites would’ve crashed or bots would’ve gotten them all (and if released via raffle, the chances of getting a pair would’ve been effectively zero). But because of our IPO model none of those things even came close to happening. Instead, everyone had a fair and equal chance to cop at a price they were willing to pay. Even better, over 90% of Bidders got the slides for less than they were willing to pay. And that price is still way less than the resell market value, making it a great opportunity for those looking to flip. There was no riot, no bot, no backdoor sales, and no site crashing. We even got great press because of it. By letting the market decide the value of these slides from the jump, we essentially streamlined the entire process from release to resell. At StockX, we think this a fundamentally better way to release and price hyped products. We don’t set the price; you do. That’s how the resell market works and we think this is how the retail market should work as well.